As trees change from vibrant greens to hues of red, orange and yellow, a colorful variety of events begin to pop up around Wichita. From festivals to family nights at museums, there’s something everyone in the family can enjoy. Grab the kids and take a trip back in time for all educational adventure in the Cretaceous period. Meet Ivan, one of the most complete Tyrannosaurus rex skeletons in the country. He stands 38 feet, nine inches long and would have weighted more than 5 tons! You can also learn about European dynasties and trace royal lineage back to the Dark Ages. Do you have what it would have taken to rule a country? Get a sense of German history and heritage while standing next to a piece of the Berlin Wall. This 4-½ ton slab stands 12 feet high, intact with its original graffiti. On Family Night at the Museum of World Treasures, all tickets are just $5 a person. And don’t miss out on Smithsonian Museum Day Live! where friends and family can get into several Wichita museums for free. For the list, click here. Feed the family with several flavors of barbecue at the Derby BBQ Festival. With a BBQ Cookoff, People’s Choice Contest, car show, food trucks, live music and children’s activities will keep everyone entertained. New this year, the Kid’s Q event brings two categories of children cooking their own hamburger and chicken on a charcoal grill. Winners will have a chance to win cash prizes and ribbons for 1st, 2nd and 3rd place. Also new this year, the Anything on a Stick contest puts cooks to work on concocting the best treat in dessert and non-dessert categories. Plus – all you can eat barbecue during this free family event. 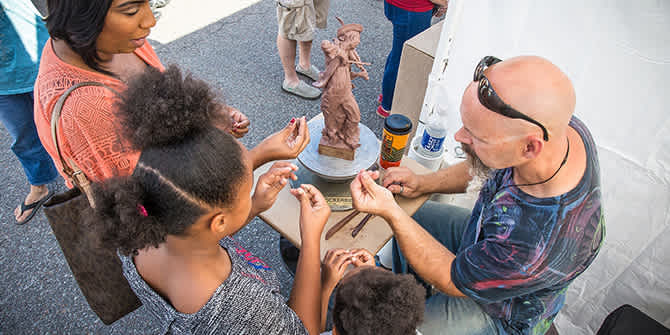 Get creative with your kids at this year’s Autumn & Art Festival in Bradley Fair. Browse and purchase art from about 100 artists from all over the country. The kids can create masterpieces of their own or play art-themed games throughout the day. Learn more about this free event here. Hop a ride through Union Station on an authentic, coal-fired steam locomotive at Kansas Railfest. Enjoy live music, artists, shopping, interactive activities for both kids and adults and a learning experience like none other. Proceeds go to preserve the history of railroading through the restoration and education of the Great Plains Transportation Museum. This event is only $10 for adults and free for kids under the age of 12. Immerse yourself in Scottish culture and witness the competitive nature of the Highland Games at the Great Plains Renaissance & Scottish Festival at Sedgwick County Park. Grab a traditional turkey leg and walk through the vendors’ area to see handmade goods like chain mail, armor and wood-crafted accessories. Take notes from the Falcon Master as you are schooled in birds of prey. The kids have a special corner filled with activities like face-painting, games and family-friend entertainment. Buy your tickets online ahead of time and receive one free children’s pass for every paying adult. Learn about other exclusive activities here. Relive the Wild West as the cattle drive of the Chisholm Trail ends in Wichita. Ranchers will be travelling from Pond Creek, OK, driving a herd up to the Wichita Union Stockyards Event Center at MacArthur and Hoover. Bring the whole family to watch this re-enactment, commemorating the 150th anniversary of the Chisholm Trail. The herd is expected to reach Wichita on Sept. 23. View other Chisholm Trail 150th anniversary events here. Get out and get active in downtown Wichita with the city’s newest initiative, Open Streets ICT. Four miles of Douglas Avenue will be shut down on Sept. 24 for biking, walking, jogging, yoga, arts, entertainment, dancing and a fun, interactive environment to bring young and old together. This community-oriented event is great for those wanting to get out and enjoy the fresh, autumn air. Plus, it benefits emotional, psychological and physical health. Chili-lovers unite for an annual event bringing more than 70 different types of chili and salsa to one, centralized location. This family-friendly event is free, except if you’d like to purchase a tasting kit for $5. Use it to try chili from local and regional cooks, vying to create the best bowl and head to the World Championship Chili Cookoff. It’s all happening in downtown Wichita. There’s also a kids zone, a flyover and vehicles on display. You can learn more about the Wichita Wagonmasters Chili Cookoff here. Take the kids out for a night of arts and culture as the Wichita Symphony Orchestra brings the music of Harry Potter to life. It doesn’t matter if you didn’t get your Hogwarts acceptance letter, everyone is welcome! You might even catch a glimpse of Ron Weasley or Hermoine Granger lurking about. For even more events happening this fall, check out the full list here.